Conway Christian School is committed to enhancing and strengthening our Accelerated Reader (AR) program. The acclaimed reading and testing program was adopted by schools nationwide over the past several years. Students in 3rd - 6th grades will participate in Accelerated Reader and will have weekly scheduled AR time in the elementary computer lab. Students have access to quizzes for easy, juvenile and upper-level fiction and nonfiction books. Because AR is web-based, we always have access to the most up-to-date quizzes available, plus selected quizzes that the vast AR program already offers to schools. Accelerated Reader has a special feature called Renaissance Home Connect (Home Connect), which families can access outside of school from any computer with an Internet connection. Home Connect is fun and easy to use. 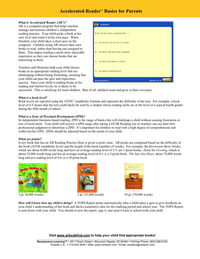 It allows the teacher, student, and parent to share information about your child’s progress in Accelerated Reader. While Home Connect provides an avenue for tracking you child’s progress, it is not the same thing as Accelerated Reader and students will NOT be able to quiz at home. You can view Home Connect from any computer with an Internet connection using a web browser. If you’d like to receive emails showing your student’s quiz or test results, click the Email Setup link in Renaissance Home Connect and follow the directions. To be sure these emails reach your inbox, add homeconnectautodelivery@renlearnrp.com to your address book.